This month our featured 'Real Wedding' couple is Alex and Gareth, who were married in August at Mossley Hill Church, followed by a reception at Allerton Manor Golf Club. Alex had a gorgeous rustic theme and wanted a bouquet with lots of textures. She wanted flowers for herself, her Groom, Bridesmaid and flowers in the Church and Wedding Venue. After a wedding consultation with us, she decided on beautiful bay trees outside the church, a wedding pedestal in white and blue inside the church and hydrangea plants to decorate the aisles. 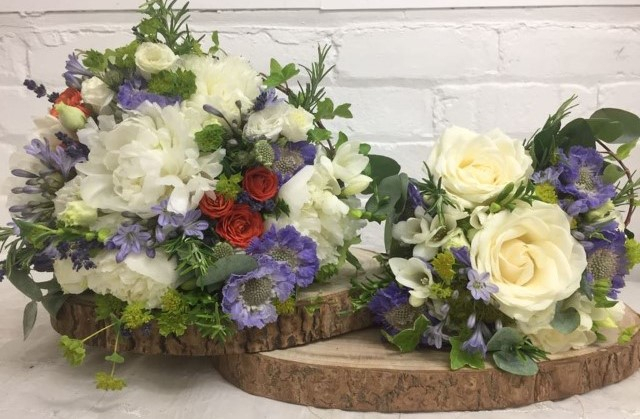 Her hand-tied bouquet featured white peonies, orange spray roses, white lisianthus, white freesia, blue scabiosa, blue agapanthus, rosemary, lavender, bluperlum, eucalyptus and Ivy. Her Bridesmaid had a similar smaller hand-tied bouquet containing the same flowers, while her Groom had a white peony and orange spray rose buttonhole. We suggested Alex have a small bit of orange (in the form of orange spray roses) in her bouquet, to match the orange lining in the Groom's suit - which we think worked really well. To see more photos of Alex and Gareth's gorgeous flowers, check out their Wedding Flowers gallery. All the pictures on our website are from real Weddings, so if you want some further inspiration or would like to read our Bride's testimonials (like Alex's below) then check out our Liverpool Wedding Florists website.